Originally opened in 1988 by the Sarajian family, The Original Bailey's (formerly Bailey’s Rib & Steakhouse) has been a Mount Pocono, PA, favorite for a long time, and is still owned by the Sarajian family today. Bailey’s building is quite historic – originally built in the 1920’s as a convent for the Diocese of Scranton, during its hotel days it was known as the Thunderbird. The Sarajians have transformed the building into a large restaurant with a separate bar area, several intimate dining areas, and larger rooms able to accommodate large families with children. Quality is the belief behind Bailey’s food. Every steak Bailey’s serves is U.S.D.A. top choice or higher and our hamburgers are made from Certified Angus Beef. Our baby back ribs all smoke overnight, low and slow, to provide a tender, moist rack of ribs. Seafood is supplied from one of Bailey’s sister restaurants, Smuggler’s Cove, which has been in the seafood business for over 30 years. Bailey’s menu is quite extensive with awesome burgers, succulent ribs, and fresh seafood and pasta. We offer a great children’s menu and a large variety of meal options. At Bailey’s, we offer value, which we believe is the combination of exceptional quality for a reasonable price in a casual, relaxing atmosphere. 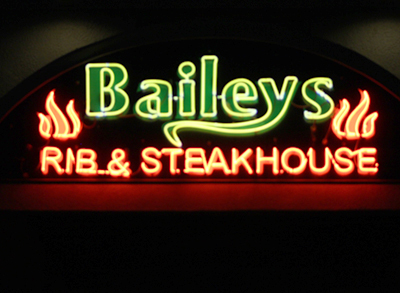 Please stop in or contact us today at 570-839-9678 if you have any questions about The Original Bailey’s or any of our other restaurants that are part of our family.